After a brief pause on mod releases for personal reasons, let's get back on track: second follower Mod on Steam released (and probably the last one). As always, there is a MEGA link after the screenshots and before the Steam description for non-Steam users. Update: version 1.1 is out, adding wearable Inari Ears and Tails. Please read at least the GENERAL INFORMATION and the TROUBLESHOOTING before posting about an issue or CTD. On the comments, I won't reply to "It won't work" comments without explaining at least when it crashes (on Skyrim logo, loading a game, entering the cabin area/cell...). This mod adds a follower in a new cabin across Pinewatch Cottage (check screenshots) based on the Inari Race created by Kogane to Oblivion. Isn't lore friendly and I am aware of that. If you think this mod isn't for you, just forget it exists - it is pointless to discuss this MOD based on personal tastes/preferences and mod bashing comments will be deleted. If you like the concept and want to add your opinion or help improve it, please leave a comment. Spells & Shouts: Relies hugely on magic combat/defense; uses drain health, restoration, alteration and illusion spells. Armor: Custom UNP Savior Hide Armor. Some lore background to support her appearance: she was blessed by Hircine as Champion for completing the Wild Hunt, but Sheogorath cursed her to have an animal hybrid aspect, a way to mock Wild Hunt ritual and an attempt to drive her crazy. Luckily Seon's strong will and discipline prevent her from madness; her hunting/patrol duty grants the respect from the Falkreath hold, keeping the road clean from bandits and predators. It is a good idea to save your game away from Pinewatch Cottage or inside an interior cell (house/cave/city) before installing this mod to avoid CTD. This follower mod is the mash-up of 3 personal mods: a race mod, a NPC/follower based on a player character and an house mod. This follower concept started after a fellow user from another Skyrim related forum requested the port of Kogane's Oblivion Inari assets (ear and tail) to Skyrim. For compatibility reasons (it requires RaceCompatibility.esm, not available on Steam), the NPC uses a vanilla Nord race instead of a custom race, so anyone can use the mod without dependencies. High alteration/archery/illusion skills, low melee/physical defense habilities. The biggest challenge was to give her a close combat option, since unarmed combat, the use of swords/daggers/axes or strong destruction spells were out of the question. I ended up giving her the absorb health spell, similar to the one vampires use, even if this is not technically melee combat. The Oblivion Mod also gives conjuration a nice boost, but this version doesn't make it relevant. A former character of mine, created with ECE. She levels with the character from level 1 to 100, flagged as essential. Marriage option is locked for now, so you have to use a console command workaround. She uses custom enchanted armor/bow (not playable by the character); her body is UNP and the armor is a custom modification from Exeter UNP vanilla remodeled armors. If you have a melee-style character, she fits well as she likes to fight from distance. For low-level character, there is a good chance that she could be too powerful, but I have no feedback to support this assumption. She has her own schedule (sleep/eat/patrol & hunt) and high magika skills developed, mainly a specific skill to absorb the vitality from her foes, similar to the one vampires have. As a matter of personal preference, I like to have a follower that can pick those high-level locks, and she is one of that kind, having a good stock of lockpicks. This was my learning process of house/cell creation following DarkFox127 (and others) tutorials. I like the concept of followers to have their own place to live (instead of living in inns), but that increases the mod incompatibility, so I rather pick up abandoned camps or small caves as meeting locations for releases and keep the follower with houses concept for personal use. This is one of the exceptions. An hunter cabin using Stroti's wonderful resources. You can find it fast traveling to Pinewatch cottage, then get on the road and head to your left; the cabin is just a couple of steps ahead. There is an unenchanted Seon's Bow for you in the top of the dresser. - changing her outfit can lead to weird results since she use her own custom body/textures, specially if you use other body than 7B/UNP/Vanilla. Should be compatible with anything except mods who affect the cell where the Cabin is set. 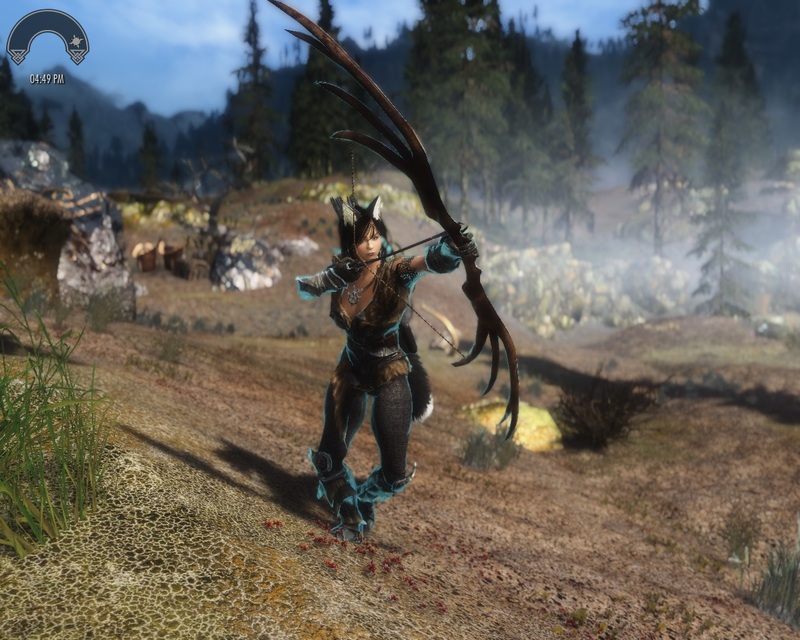 Problem: She don't use her custom bow, she is using a normal hunting bow. Answer: This is a know issue with some followers and happened to me; the workaround is to talk to her and remove the hunting bow from her inventory. Problem: I can't assign her as a steward. Problem: When I change her armor, the body textures mismatch or I get gaps on the head/hands/feet. Answer: She use custom textures/body and your armor is linked to your body/textures type. I can't help you here. Problem: Her armor looks different on my game. Answer: I use aMidianBorn textures by CaBaL(http://www.nexusmods.com/skyrim/mods/24909/? ), that can't be shared outside Nexus. The Mod will use your Hide armor textures installed, so if you don't have any texture replacer for it, you'll get vanilla textures. Question: Can I use her ears/tail too? Answer: not for now, at least without editing the plugin file or using the console. Haven't decided on a way to implement it in game (via Spell or just as an Armor/clothing item) and I don't know if people are interested in that. There are other mods that add a good variety of ears and tails to characters. 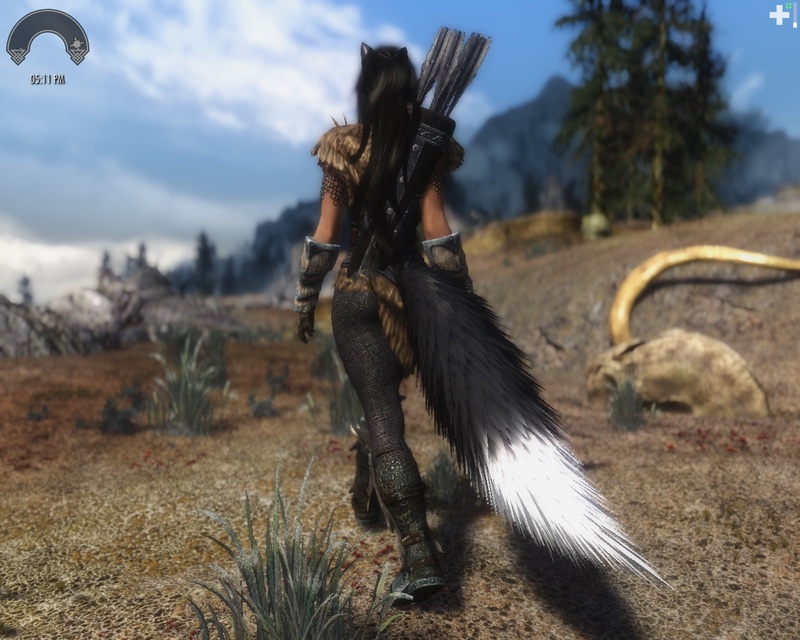 - Ear, Tail and Original Race concept: Inari Race by Hidemaro http://www.nexusmods.com/oblivion/mods/43047/? 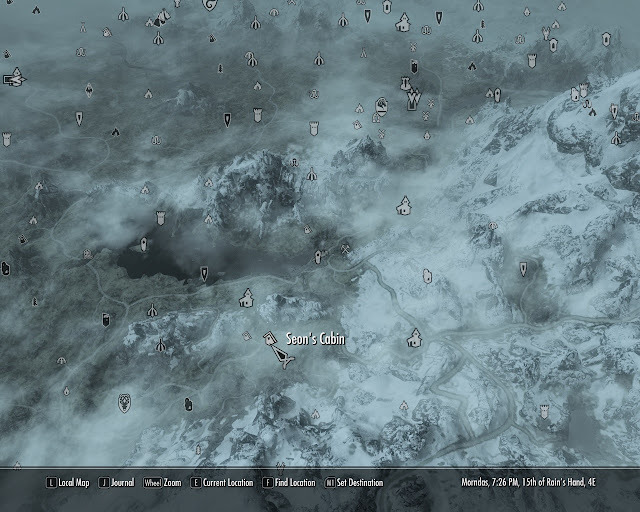 - Base Body: Caliente's CBBE http://www.nexusmods.com/skyrim/mods/2666/? - Face and Body Textures: FrankSunday Pretty girl like SuzumiyaHaruhi CV Aya. http://www.nexusmods.com/skyrim/mods/8232/? - Face _msn texture: No More Blocky Faces: http://www.nexusmods.com/skyrim/mods/30/? - Armor: UNP Female Armors by Exeter http://www.nexusmods.com/skyrim/mods/7305/? - Cabin: Strotis old cabin resource by Stroti and Tamira http://www.nexusmods.com/skyrim/mods/24271/?